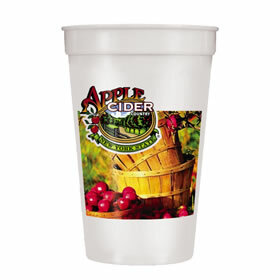 Our 17 Ounce White Plastic Stadium Cups are imprinted with any full color design you choose, including photos! Made of durable, heavy duty plastic, these Reusable Customized Stadium Cups make popular give-aways. Full Color Custom Stadium Cups are great for trade shows, sporting events, promotions, birthdays, and more. We also offer matching frosted plastic lids for the Stadium Cups. Production time on Full Color Custom Imprinted Stadium Cups is ten to fifteen days. Rush production is available. 80-170017 17 oz. Smooth Stadium Cup with Full Color Imprint on 1 Side $1.33 $1.25 $1.19 $1.13 3⅞" 3"
82-170017 17oz. Smooth Stadium Cup with Full Color Imprint on 2 Sides $1.89 $1.79 $1.73 $1.67 3⅞" 3"
83-170017 17 oz. Smooth Stadium Cup with Full Color Imprint Wrapped Around Cup $2.29 $2.19 $2.13 $2.07 3⅞" 3"
Exact color match is not available. Please provide CMYK artwork. For additional information on our Custom Imprinted Stadium Cups, please contact us at 1-800-233-0828. You might also be interested in browsing our complete line of other Custom Imprinted Plastic Glasses, including Custom Plastic Pint Glasses, Custom Plastic Hurricane Glasses, Custom Plastic Shot Glasses, and more!